Description: It is a subshrub notable for the profusion of bright scarlet flowers in late summer and autumn. Petals 8–17 mm. Leaf: 5–50 mm, linear to egg-shaped, green to grayish, sometimes strongly toothed. 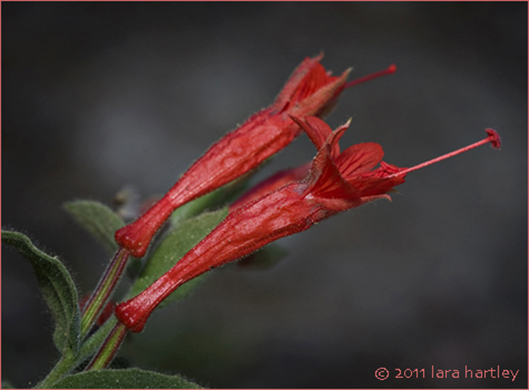 Notes: Epilobium canum is often pollinated by hummingbirds. In a garden the plant prefers to be cultivated in well-drained soil exposed to full sun but protected from the wind, and needs little watering. Cultivated varieties come in other colors besides red — pink and white are common. It is a perennial herb that is native to California and is also found outside of California, but is confined to western North America. Photographed June 17, 2005 in the San Gabriel Mountains with a Canon EOS 10D, 100mm macro lens.